Here you will find one-of-a-kind items and very very limited editions. Jewels sold here are fancy jewelry : they are not fine precious jewelry ! The cabochons used here are - for the most part - either Swarovski crystals or colored glass. Occasionally, it may be a different material ( mother-of-pearl, abalone, shell ). In this case, this specificity will be clearly stipulated in the item's description. The cameos used for these jewels are not genuine cameos but fine resin imitations. Realistic, full of details, these cameos are faithful reproductions that will not disappoint you. Faceted beads are colored glass and faux-pearls are made of resin (or sometimes waxed glass). Stampings, chains and findings used here are for the most part brass metal and treated to give them a silvery aspect (or an antique gold look for some other jewels). This is not sterling silver or other precious metals. We remind you that you must not wash with your jewelry or put them in water. Be delicate and as possible avoid shocks : they are resistant items but nevertheless fragile if one does not handle them with care and precaution. In this specific case, we can unfortunately only advise against the purchase of these jewels. For international transactions, we accept PAYPAL. PAYPAL is a safe instant and secure electronic payment. All shipments are provided with tracking information. Once your payment is finalized, we will keep you in touch shortly with your tracking. Shipping costs are calculated proportionally to the weight of your order. Shopping cart will allow you to have an easy overview of your shipping costs before validation of your purchase. - Shipping costs for a small single item to Europe are 5,60 euros. - Shipping costs for a small single item to the rest of the world are 5,80 euros. Please note that we ONLY charge you for the shipping costs and nothing more ! Important : We are not responsible for any additional fee, taxes or duties that may be charged by your bank and/or at customs in your country. You have spotted an item in store, but it is no longer available ? You really love this necklace but this color does not suit you ? You are getting married and need personalized jewelry ? No problem ! Feel free to contact us about your own project, we will be happy to be able to follow up on your request - as far as possible - depending of supplies that we have in stock to concretize your ideas. A money deposit will be asked once your custom order is confirmed. DO YOU SELL THE JEWELS I HAVE SEEN IN YOUR PHOTOSHOOT ? Sorry ... But all the jewelry that you may have seen in "Photoshoots & Collaborations" galleries are not meant to be sold. However, believe that as soon as we will found a way to make these pieces in several copies and - especially - cheaply for our customers, you will be the first informed ! Thank for your understanding. You have a right of withdrawal of 14 working days from receipt of your order. 1 °) Inform us quickly with your request as well as the reason of the return. 2 °) The parcel will have to be returned to your personal expenses by the same type of shipping as during the expedition (with tracking). 3 °) Item(s) must be in MINT condition : complete, intact, undamaged in their original packaging. If these conditions are respected, you will have a refund of the same amount as your initial purchase (excluding shipping costs of course). IMPORTANT : Note that custom order and personalized jewelry can not be returned or refunded. All information and personal data collected here are required for billing and delivery of your purchases but remain strictly confidential. You have the right to access, modify and delete your personal data. A MON SEUL DESIR ... BUT WHAT DOES THAT MEAN ? 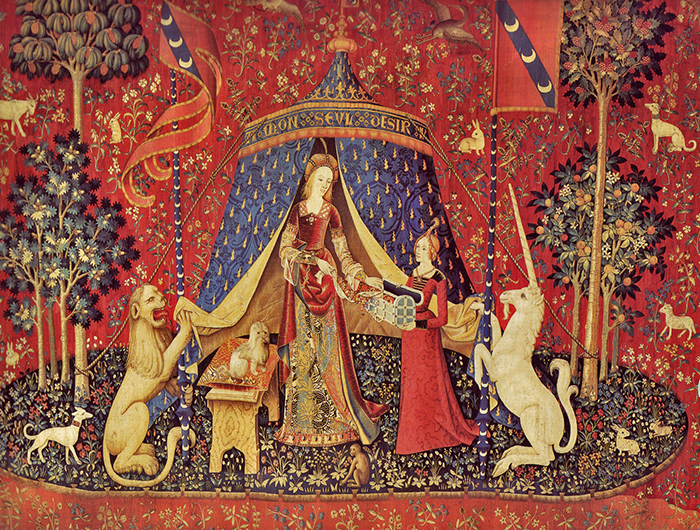 A MON SEUL DESIR is the name of one of the six medieval tapestries set called "The Lady and the Unicorn" ("La Dame à la Licorne" in French ) preserved in Cluny's museum in Paris ( France ). 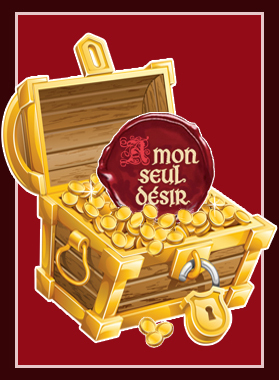 A MON SEUL DESIR is the inscription written on the top of the tent with yellow letters. However, if you want to know more, you can read the HERE dedicated page on Wikipedia !